Can Skyward Sword Provide a Balanced Zelda? 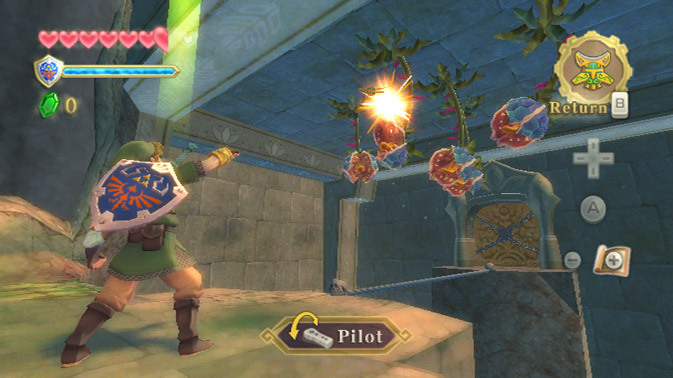 Throughout the development of Skyward Sword, much has been made of the topic of the Motion Plus Controls, and the effect they will have on the game. Developers and reviewers alike have echoed the sentiment that it makes every enemy seem almost like a puzzle itself. A review by GameRant posed the question to their fans: Does this focus on puzzles increase or decrease your interest in the game? To me, when it comes to the Zelda gameplay formula, there’s a specific balance that creates the perfect Zelda feel. Zelda isn’t known just as a game where you swing a sword at the bad guy. It’s also not just a game where you try to find your way through a maze. It certainly isn’t just another puzzle game. A successful Zelda game has to find the right balance between combat, exploration, and puzzles in order to fully achieve what makes the franchise great. The subject of a Zelda game potentially being too puzzle-based immediately brought Spirit Tracks to mind. While this game is still a solid experience, there’s no doubt that the puzzle aspect of the Zelda formula was front and center, while combat and exploration took a huge hit. Not being able to get out of my train an explore every inch of the overworld made the environment of Hyrule far less immersive and enjoyable. While the dungeons had some interesting and innovative puzzles, especially in the Tower of Spirits, they were largely devoid of enemies. Some fear that with Motion Plus Controls, the emphasis for Zelda is going to continue to shift in the direction of puzzle-based gameplay, and a lot of the core elements that we love are going to become less and less relevant. When I think of a truly balanced Zelda game, the first thing name that comes to mind is definitely A Link to the Past. How did it achieve this? It took all the things that were already good about Zelda, and expanded on them. It innovated, and gave us a bigger, better Zelda experience that what was previously achievable from the NES games. It upped the combat several notches by letting Link actually swing his sword, as opposed to stabbing, adding in the spin attack, and giving Link one of the largest inventories of items and weapons to date. It took the simple “push a block to open a secret door” puzzles of the original Zelda and expanded them to include all kinds of puzzles that are still in the series to day. A more detailed and intricate Hyrule was explorable, along with an entirely new overworld. And all of these worked together in a perfect balance. Link’s new items were useful in combat, puzzles, and exploration. The use of a Light World/Dark World mechanic created puzzles, such as unlocking the Swamp Dungeon, as well as giving Link two worlds to explore. It simply innovated in all three areas, and did so in a way that none of them took away from the others. They worked together in harmony for the best possible gameplay. I see the Motion Plus Controls not as a potential warning sign that Skyward Sword will just be one big puzzle game, but as a chance for Nintendo to give us another perfectly balanced Zelda game. Just as the Light World/Dark World mechanic of A Link to the Past was a perfect blend of puzzle and exploration, using realistic sword movements can blend puzzle and combat into one. We’ve been promised new items in Skyward Sword, and we’ve already seen the Beatle. These new items, specifically designed to make use of the Wii Motion Plus give Skyward Sword the chance to again innovate on an already solid Zelda foundation. So when I hear “each enemy is like a puzzle itself”, I don’t worry that Zelda has lost its edge. I believe that they’ve found a way to blend the puzzle and combat elements into one, in a way that won’t take away from either, but will add to both. And when it comes to exploration, Nintendo has been saying for months now that they know the old formula needed some changes, and they plan to provide it. We’ve heard from the developers themsleves say that the oveworld and dungeon segregations will be far less noticeable, implying a denser, more intricate, and more involved overworld, and now we’re hearing reports and reviews from people at E3 confirming exactly that. Not to mention, the dual overworld concept is getting a nice new overhaul in that Skyloft involves travel by flight. Flight powered by Wii Motion Controls, and adding to the exploration factor. 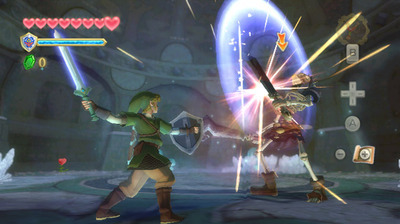 Skyward Sword is slated for a Holiday 2011 release, and I what I want for Christmas is a balanced Zelda experience. From what I’ve seen, I believe I’ll be getting just that. What are your thoughts? Do you expect the Motion Plus Controls to add to your gameplay, or take away?